Under Jean-Claude Juncker, the European Commission hopes to become more transparent, signifying a new effort to mollify concerns about the Transatlantic Trade and Investment Partnership (TTIP). EURACTIV Germany reports. From 1 December 2014, the European Commission plans to post all contacts of Commissioners, those of their cabinet employees and their directors-general with lobbyists and interest representatives on the institution’s register. Before taking office, Commission President Juncker outlined in his political guidelines the intention to introduce more transparency in the Commission, especially on contact with lobbyists and interest groups. Together with Parliament and the Council, Juncker indicated his hope to reach an inter-institutional agreement over creating a mandatory lobbyist register for all three EU institutions. 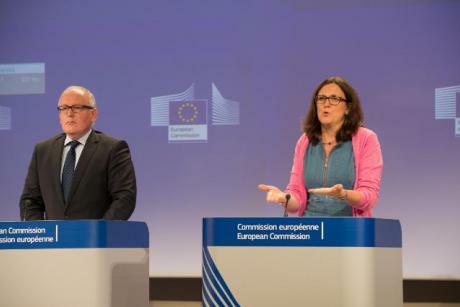 Trade Commissioner Cecilia Malmström announced that more documents pertaining to negotiations with the United States over the Transatlantic Trade and Investment Partnership (TTIP) are open to the public than before, but “more can be done”. On Tuesday (18 November) afternoon, Malmström spoke at a conference in the European Parliament titled “TTIP and Consumers: The Good, the Bad, and the Ugly”. “First, we can and we must negotiate an agreement that responds to European consumers’ needs and concerns. It cannot be bad or ugly. And second, we can only do that if we work cooperatively with all the different political forces and civil society organisations across our continent, and with our partners on the other side of the Atlantic,” Malmström explained before the Parliament. Since the start of TTIP talks between the EU and the United States, there has been a heated debate over the balance between highest possible transparency and necessary confidentiality. After the presentation by Timmermans and Malmström, Daniel Caspary, coordinator in the Parliament’s Committee on International Trade praised the transparency initiative. “Better access to ongoing TTIP negotiations for Members of the European Parliament as well as for citizens is a correct and long-overdue step. The new developments toward more transparency on TTIP have proved to be a successful new start for the European Commission and above all Cecilia Malmström,” the German MEP said. Malmström is taking steps that have long been demanded of the European Parliament and which her predecessor Karel de Gucht neglected, Caspary explained. The European transparency register came into effect in June 2011, as part of a series of efforts to boost integrity of the institutions under the European Transparency Initiative. The register is a database of lobby firms, individuals, NGOs and other organisations working to influence EU legislation in Brussels. It currently has around 6,000 registered organisations. In June 2013, the European Commission and Parliament appointed a joint working group to review the transparency register. Dnevnik, EURACTIV partner in Bulgaria: ??????? ?? ??????? ? ???????????? ??????? ?? ?? ? ???????? ???????? EURACTIV Turkey: Avrupa Komisyonu, TTIP ve lobiler için ?effafl?k giri?imi ba?latt?